The film saw the directors move to Norway for a couple of years to get to know everyone involved and get the real scoop. A killer soundtrack and interviews with Gylve “Fenriz” Nagell, Varg “Count Grishnackh” Vikernes, Jan Axel “Hellhammer” Blomberg, Kjetil “Frost” Haraldstad, Olve “Abbath” Eikemo, Harald “Demonaz” Nævdal and Bjarne Melgaard make this a must see. 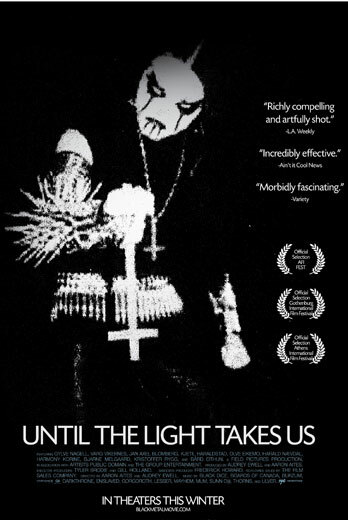 Not sure how or why Harmony Korine muscled his way into this though; what exactly has he got to do with black metal? Yes, yes, there’s metal on the Gummo soundtrack but I have it on good authority that he was rather more than slightly helped out with that one….. Anyway, the film is screening in London at the Rio on March 27th. If you are in France, join Laura Manganaro’s facebook group – if enough people join, they’ll show it there. Seriously – thats how we got the London screening rocking. It’s a shame they dont show theese kind of films here in Norway. Luckely for me, my bike and I are most likely in london that weekend..